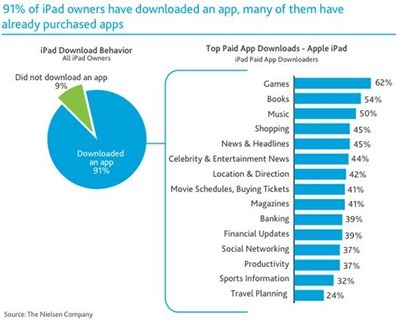 I posted yesterday about a Nielsen survey that showed what I thought was a shockingly high number of iPad users had never installed an app – nearly 2/3 of those surveyed. Well, it looks like that number was shockingly high because it wasn’t the real figure. Nielsen has posted revised data that now shows that no less than 91% of iPad owners have installed an app. Phew – glad we got that straight. Still wondering who those 9% are though. The 9% of iPad owner with no dowloaded app might be a majority of kids with no credit card accounts that received the iPad as gift.